Essential oils are an ancient medicine. They have not been used as long as herbal medicine, given the distillation technology necessary to derive the oil, but their roots are still very old. There is documented use by Islamic physicians in the 12th century and purported use (as resins) by ancient Egyptians prior to that. 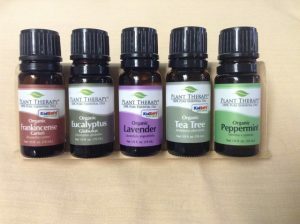 Part of the allure of essential oils is their ability to condense a massive amount of a plant’s healing potential into a very small bottle. Used throughout the centuries, essential oils have seen a renaissance in the western world, complete with a growing body of research supporting their medicinal use. Essentials oils are produced through the distillation of plant material, resulting in a condensed liquid known as a hydrosol. The volatile oils floating on top of this liquid are then siphoned off and stored in dark dropper bottles. In their purest form, essential oils have a multitude of phytochemicals that range in use from culinary to medicinal. Hundreds of oils are commercially produced, some with an amazing array of uses and others more esoteric in their application. Lavender is one oil I could not go without. Not a day goes by at the clinic without its use. After administering acupuncture, I dab a small drop of lavender essential oil behind the ear lobes to help patients relax and de-stress. Lavender is a potent nervine that calms the nervous system, relieves anxiety, and induces sleep. Lavender is also one of the best remedies to quickly relieve the pain and trauma of an acute burn while dramatically speeding up the healing process and preventing scarring. Tea tree oil is a first aid kit in a bottle. A broad-spectrum antimicrobial, tea tree oil acts as a natural antiseptic when applied to cuts and scrapes or as an antifungal that can be dabbed on toenail fungus. Try adding a few drops of tea tree oil to a bottle of witch hazel for a homemade aftershave. The astringent of the witch hazel closes the pores, while the tea tree oil prevents any razor burn from getting infected. Tea tree oil is also an excellent addition to liquid hand soap as an alternative to harsh antibacterial versions. Just add around 10 drops to a full bottle of liquid hand soap. Make sure each family member tries a small amount to ensure it does not cause a reaction, and keep full-strength tea tree oil away from pets. Eucalyptus is the oil of choice for respiratory conditions. From acute conditions such as colds, flus, bronchitis, and pneumonia to chronic conditions such as asthma, chronic obstructive pulmonary disease (COPD), and cystic fibrosis, eucalyptus essential oil can open the lungs and sinuses, alleviate congestion, and encourage relaxed respiration. The scent will remind most people of Vicks VapoRub, as eucalyptus is one of the main active ingredients. Eucalyptus is best applied on the chest so the scent can waft upward to the nose and be efficiently inhaled. Another helpful therapy is to place several drops of eucalyptus oil on a washcloth and put it over the shower drain while taking a hot shower. The heat will vaporize the essential oil as the steam quickly delivers its healing effect. Although these oils are very safe to apply topically, if you have sensitive skin it is advisable to dab a small amount on the inside of your arm in advance as a test patch and wait to see if irritation occurs. If so, you can try diluting the oil with a carrier such as olive or coconut oil to moderate the intensity.